Do you need a language booster course? If your French is limited or rusty, you need Teachers Talking French. It's an easy to use language booster course for primary practitioners. As a classroom teacher or a teaching assistant working in Key Stage 2, the course will help you deliver confidently more of your French lessons in French. Teachers Talking French follows a carefully planned linguistic progression. Previously taught language is constantly revisited and re-combined with new material, all in familiar primary classroom contexts. The recordings are structured to make it easy for you to join in and take an active part in the learning. You will also hear all items of language expertly pronounced by a native speaker. What you'll learn is specifically designed for primary teachers' needs - no time wasted on how to book hotel rooms! including all these items of vocabulary in French (see right) . . .
(i) A detailed description of the content of all 6 CDs. 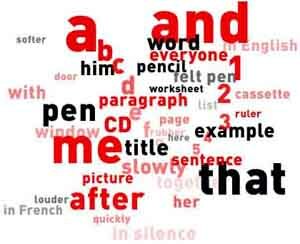 (ii) A printed list - in French - of all the vocabulary of the course. The production of personalised target language crib sheets for use in lessons and lesson planning. What makes Teachers Talking special? Teachers Talking French is a simple and straightforward audio-only course. There are NO books and NO written tasks. looking back over the lesson provides the context for work on the past tense. Teachers Talking French is much, much more than a classroom phrasebook! recycle their learning in new contexts. In addition to the audio lessons, listeners are also able to hear all items of language expertly pronounced. You should start at the beginning and work through to the end. Repeat any track as often as you need to until you feel ready to try out what you have learned in the classroom. 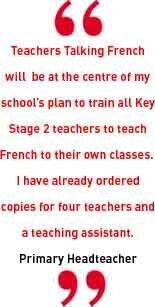 Please note that the methodology used in Teachers Talking French is appropriate for training teachers - the recordings are NOT meant for use with children. Post & packing is £ 1.99 per pack, up to a maximum of £ 6. 17.5% VAT is added to each order.